Voters of the winning butterfly are eligible for a lucky draw and stand to win an exciting mystery prize! 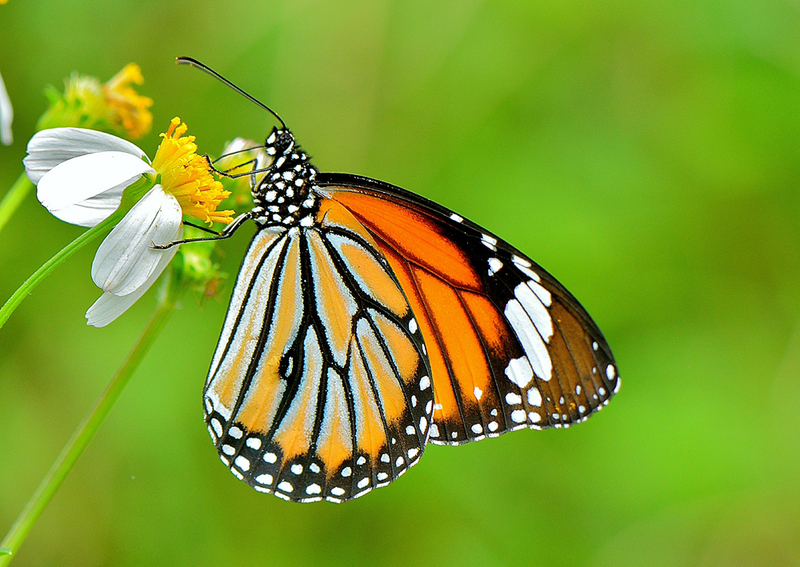 What will happen if Singapore continues to lose more of its butterfly species? therefore in the production of seeds. reptiles, and insects) will be reduced. of our environment will suffer. All Singaporeans and Singapore residents can participate in the voting for Singapore’s National Butterfly. Each person is entitled to one vote. Only one butterfly is to be chosen from the nomination list. It is timely for us to reflect upon habitat conservation especially with regard to our forests. 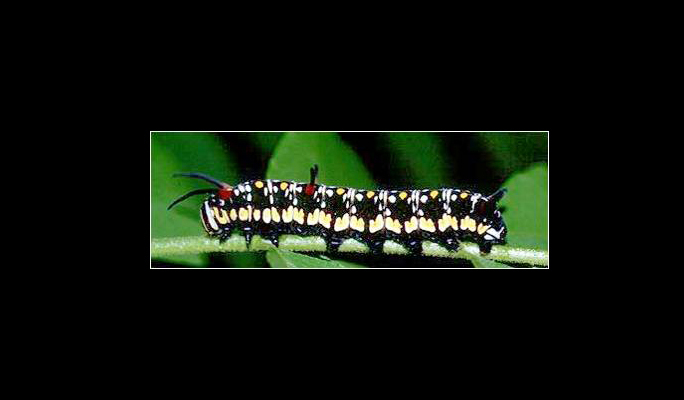 Their protection will ensure the survival of butterflies and other insects. Having a National Butterfly will help us stay focused on this issue. 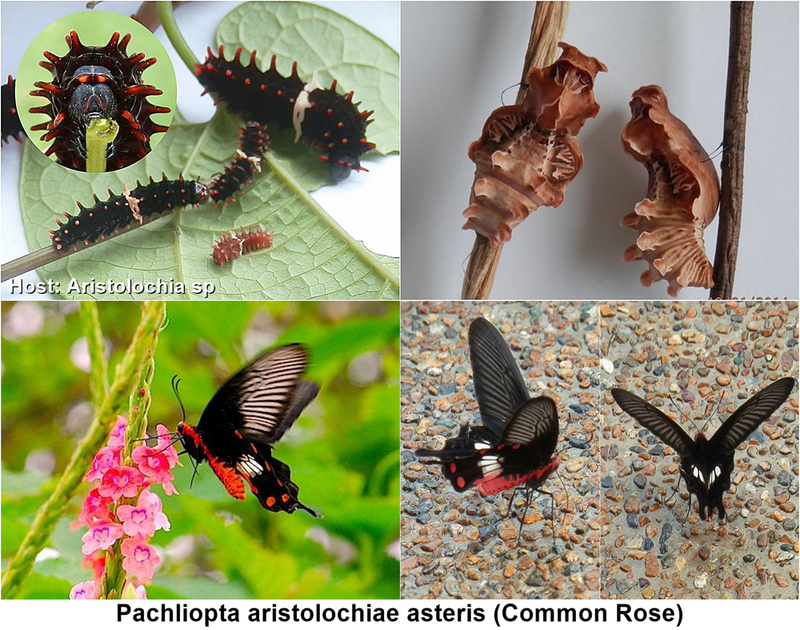 Why vote to select a National Butterfly for Singapore? 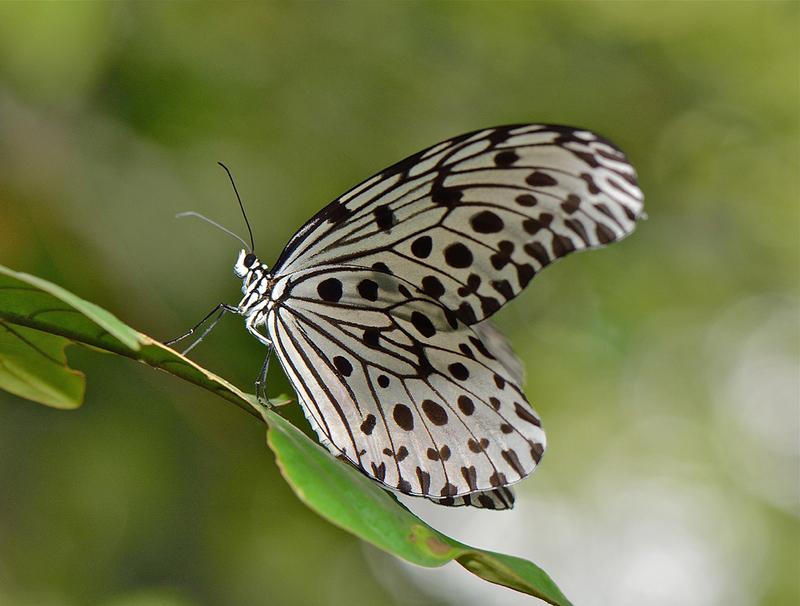 By selecting a National Butterfly for Singapore, it underlines our recognition and appreciation of the part which butterflies play towards the well-being of our environment. It will serve as a voice too for other lesser-studied but environmentally-important insects such as bees and beetles that share the same habitats. Singapore live in the forest. 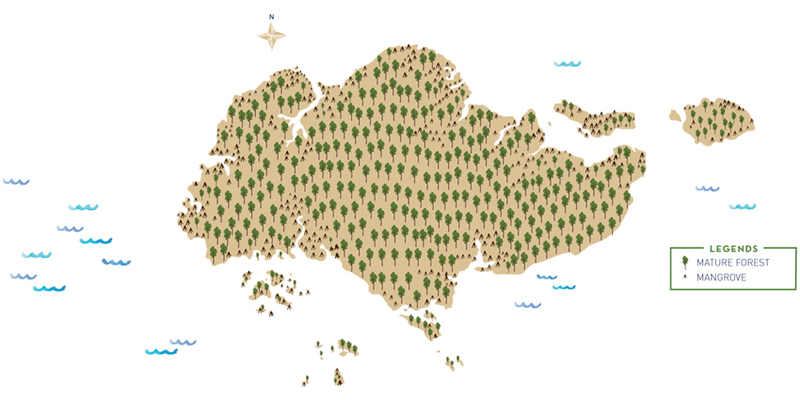 Click here to view the Past and Present of Singapore’s forests. 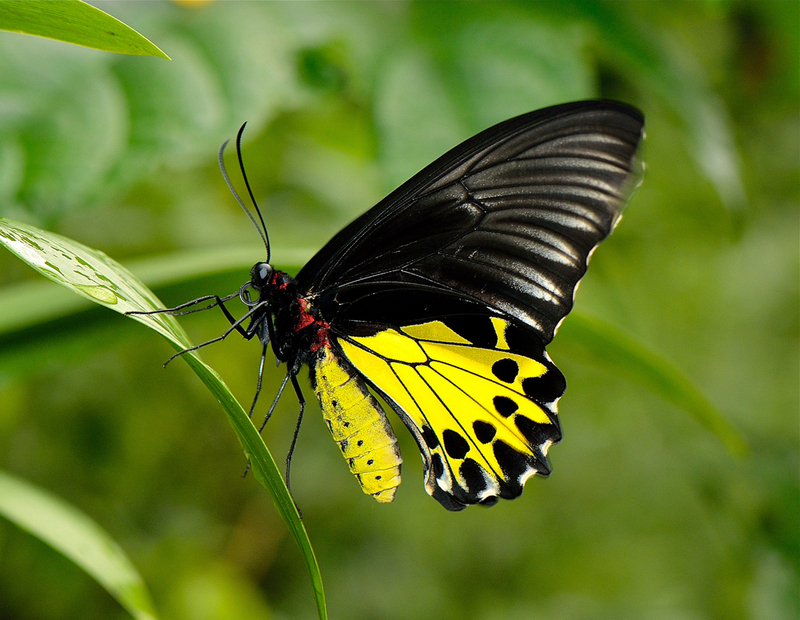 Butterflies in Singapore face several threats like forest loss, pollution and pesticide use. Many species are threatened to extinction. The nominees have been shortlisted by experts in the field. 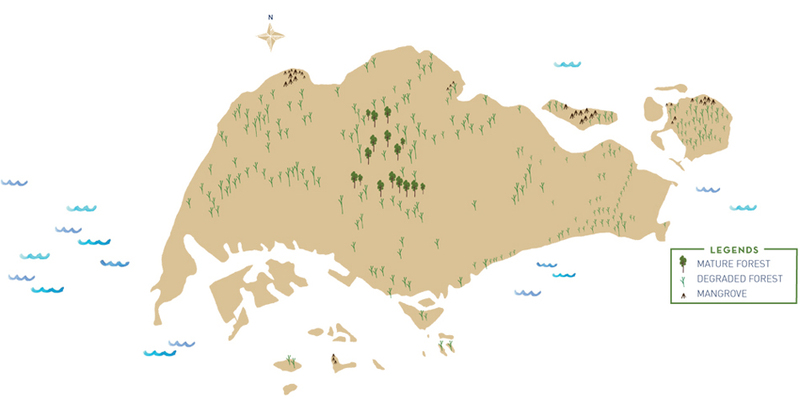 They have met most of the selection criteria set, namely: beauty, size, life status (i.e., thriving or endangered), endemism or uniqueness to Singapore and reflection of recognised Singapore traits or symbols (e.g., resilience, adaptability, the Singapore flag). In the Singapore context, our main objective is to select a butterfly which Singaporeans are able to identify with and regard as their national symbol. It must be thriving well in the environment, widely occurring and easily seen. 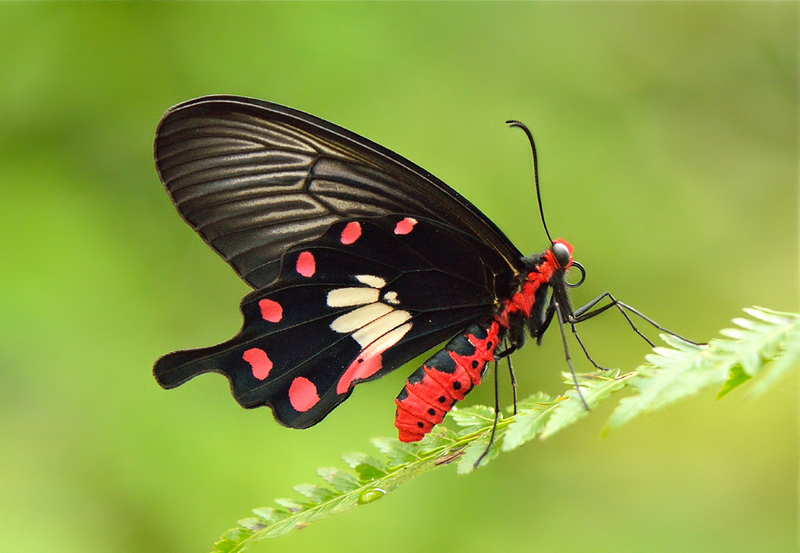 1 Beauty - The butterfly should have colours, wing shape and patterns that are eye-catching and aesthetically pleasing. The public should be able to take pride in identifying it to be our national butterfly. 2. Size - The butterfly should be large enough for everyone, young and old, to spot and observe easily. If it is too small, few people can spot it or see it well, and the public’s identification with the National Butterfly will be weak. 3. 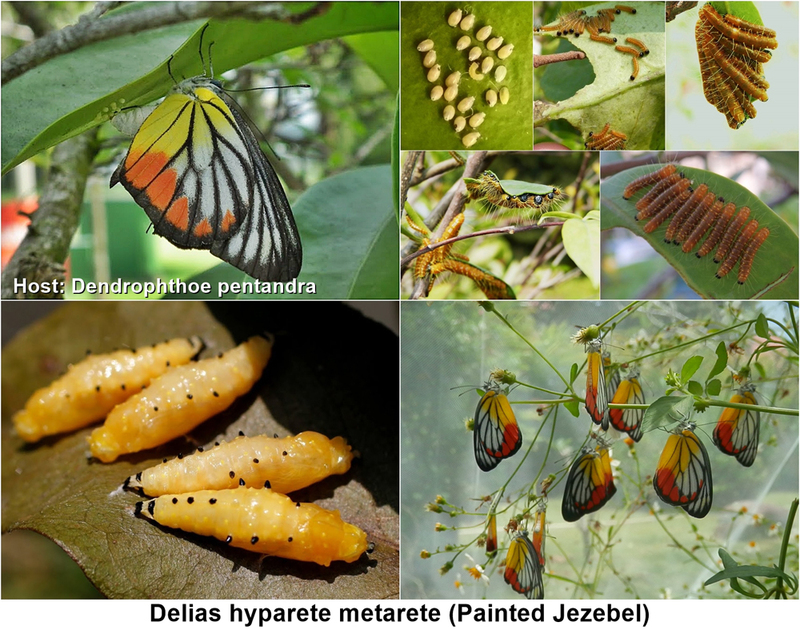 Life Status – A butterfly’s threatened status can be a selection criterion. By doing so, it serves to highlight the need for conservation efforts to protect the species. Some countries have chosen endangered species to be their National symbols, and their objective is to secure more conservation funding to protect the species concerned. 4. Endemism or Uniqueness to Singapore - Where the butterfly is unique and special as it occurs only in Singapore and nowhere else in the world. 5. Reflection of the spirit of the nation - Where the butterfly has features which can be associated with the spirit of the people of Singapore, such as resilience and adaptability, or colours aligned to national symbols like the Singapore flag. Click on the butterfly pictures to learn more about the six nominees. This large, threatened butterfly has stunning red and white colours on its wings reminiscent of our national flag colours. This large butterfly has a truly graceful and majestic flight. Found in our central catchment forests. This is a common, medium-size butterfly from the PIERIDAE-Pierinae (Whites & Sulphurs) subfamily. 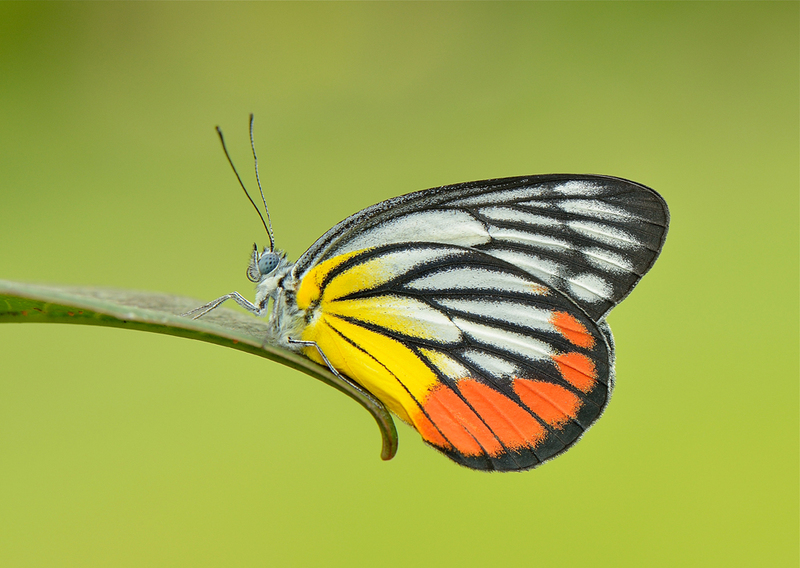 Its wings show 4 contrasting colours - white, yellow, orange and black. It is one of our most visible, adaptable and resilient butterflies. Its habitat is extremely varied. It has been sighted in forests ( inland and coastal ), grasslands, both HDB and private housing estates, and even around office blocks in the city centre where there are trees. It is active not just in sunny weather but also under cloudy and threatening skies. It has been seen flying in a drizzle. This is a large and magnificent forest species from the PAPILIONIDAE-Papilioninae (Birdwings & Swallowtails) subfamily. Its wing coloration are black and bright yellow. Due to its large size, elongated forewings with small rounded hindwings, it looks like a small bird when in flight. 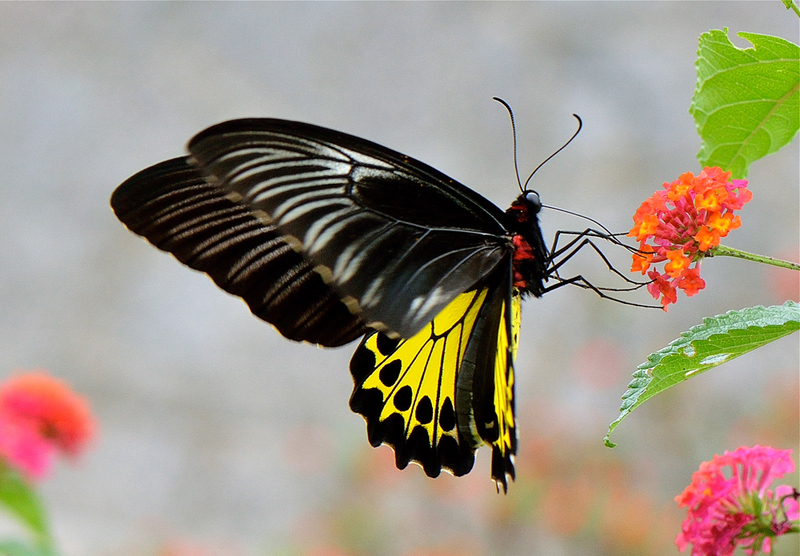 Hence its name ‘Birdwing’. 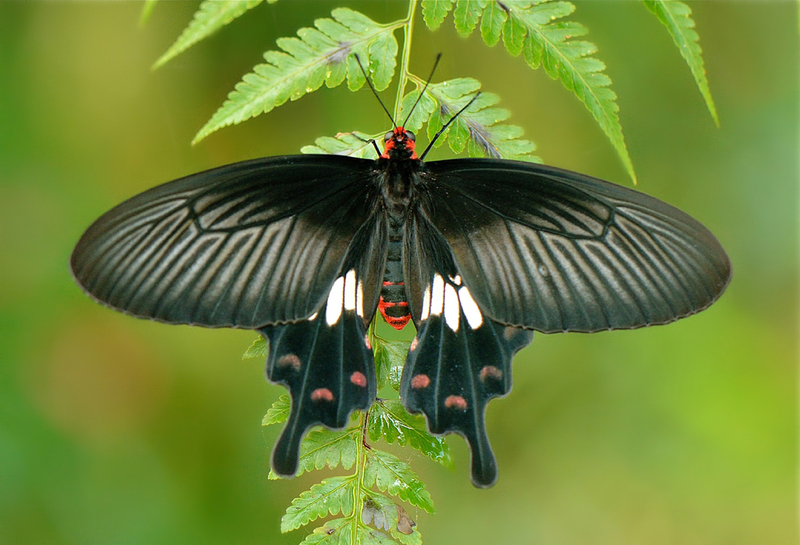 Its female has the distinction of being the largest butterfly in Singapore. It is found mainly in the forests, and very occasionally feeding upon the nectar of flowers in parks and gardens located on the forest edge. 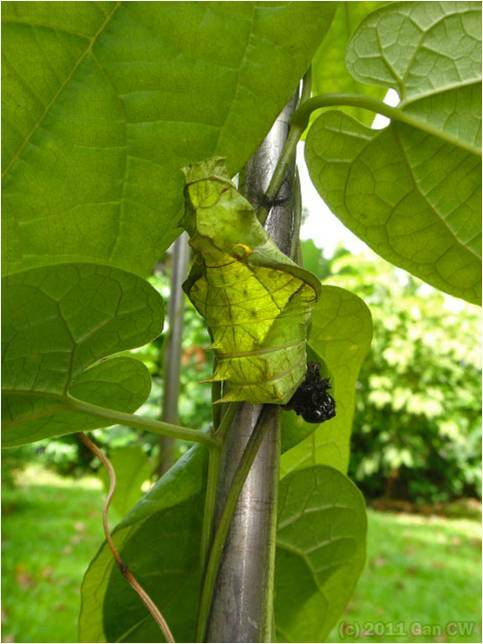 In its caterpillar stage, it feeds only on the toxic leaves of the Indian Birthwort (Aristolochia acuminata), and retains this toxicity when it is a butterfly. However, its toxicity to would-be predators like birds has not stopped its population from declining to the point of near extinction. 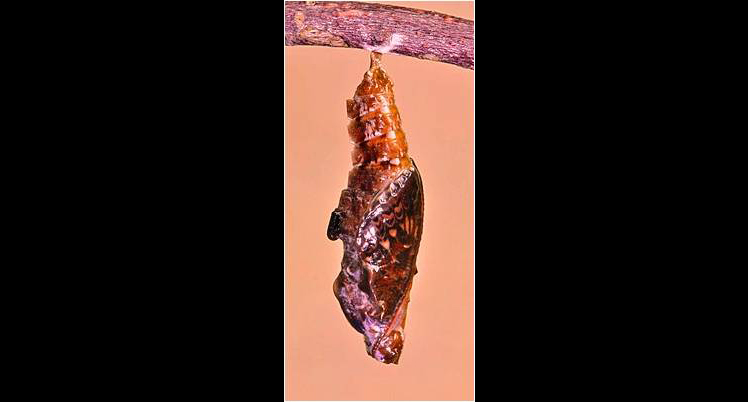 The reason for this is the butterfly’s reliance on a single host plant to feed it at the caterpillar stage. 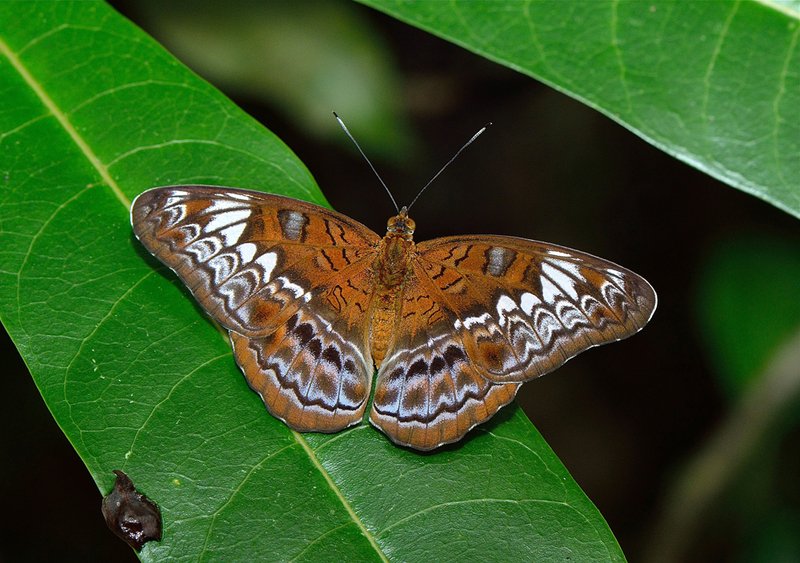 Once the distribution of this host plant is much reduced due to deforestation and disease, the survival of this butterfly is seriously threatened. This is a medium-size, graceful and attractive forest butterfly from the PAPILIONIDAE-Papilioninae (Birdwings & Swallowtails) subfamily. It has striking wing and body coloration. Its body is completely in bright red, while its wings are black with contrasting red and white colour patterns. Its red and white colours can be said to reflect our national flag colours, and some may associate the red dots with the five stars, and the white streaks with the crescent moon. 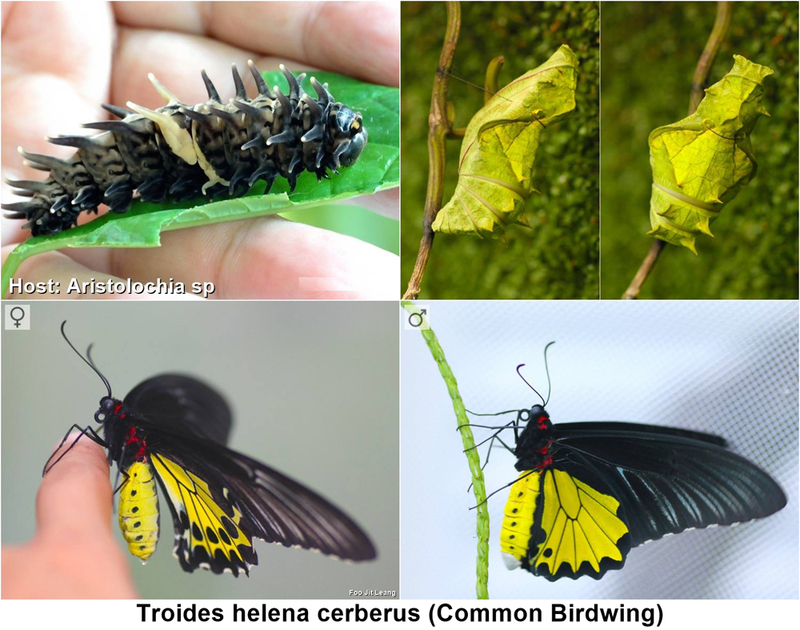 It shares the same host plant and habitat as the Common Birdwing, and while toxic to would-be predators, it is also threatened with extinction once its host plant is reduced. 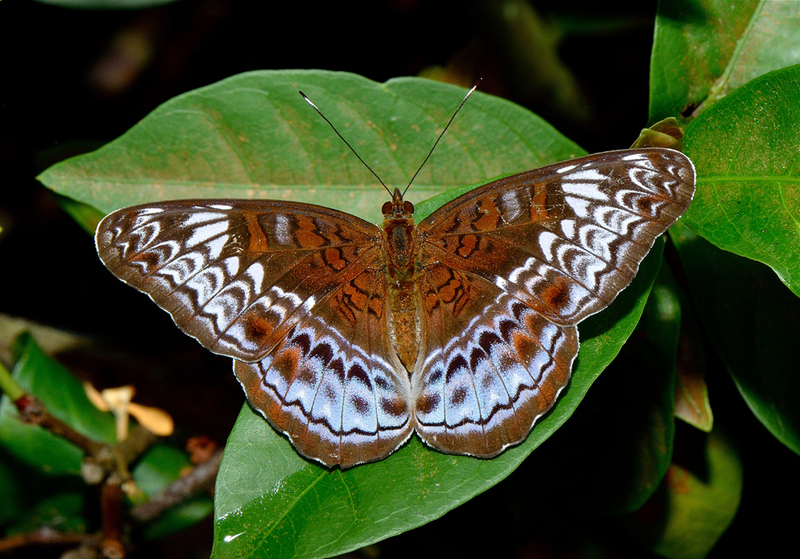 An endemic subspecies which is unique to Singapore, Johor and Riau islands, this butterfly was only discovered in the late 1970s. 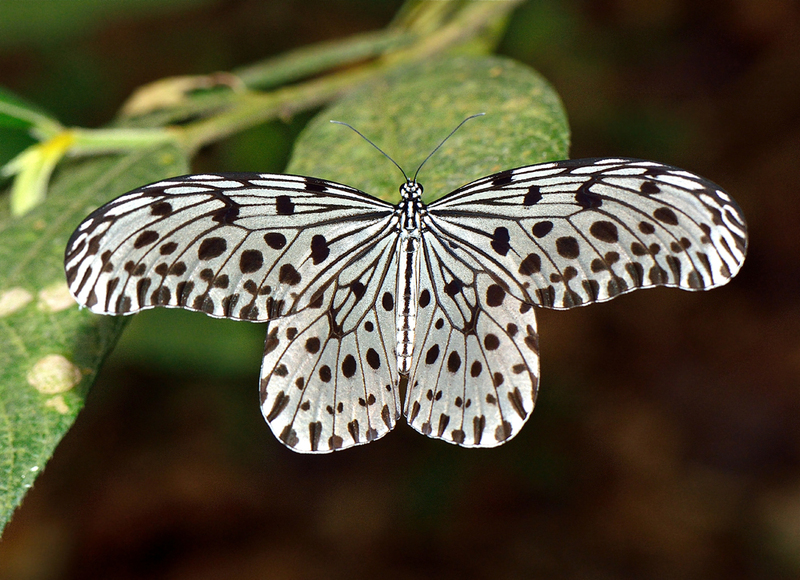 Our resident differs from its Malaysian and Thai counterparts by possessing pale mauve wing scales on its hindwings. This butterfly is from the Brushfoot Butterflies NYMPHALIDAE-Leminitidinae subfamily. It is of medium-size and shows an intricate wing pattern along the edge of its fore and hindwings. 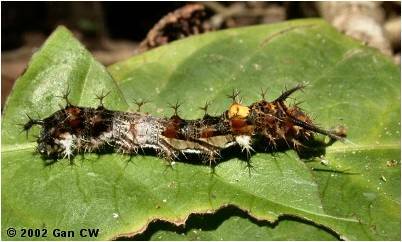 It is fairly common in the forests and can best be described as a forest resilient butterfly. It thrives in good and poor quality forests, including forest fragments. 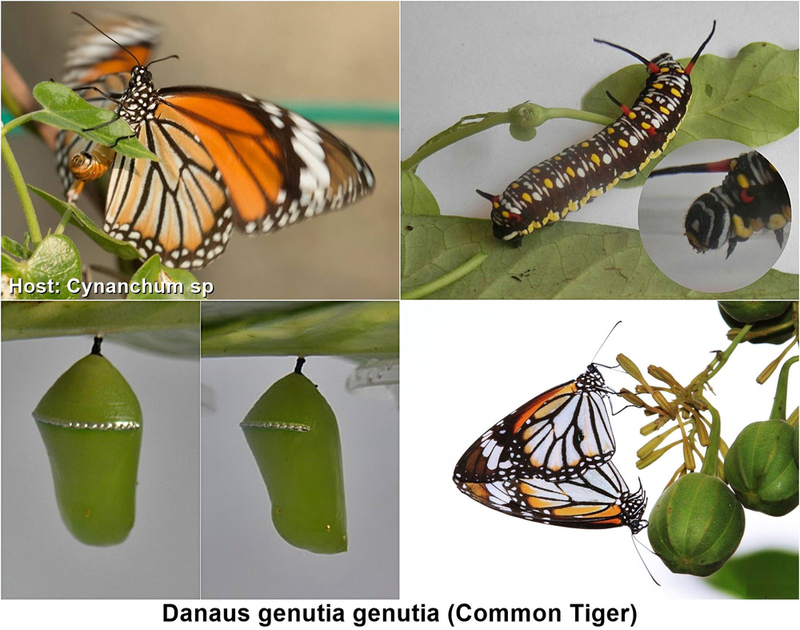 The Common Tiger butterfly is a poisonous species from the Tigers, Crows and Milkweed Butterflies NYMPHALIDAE-Danainae subfamily. It is so named because it resembles the striped animal predator, and likewise it is striking and handsome in its own way. 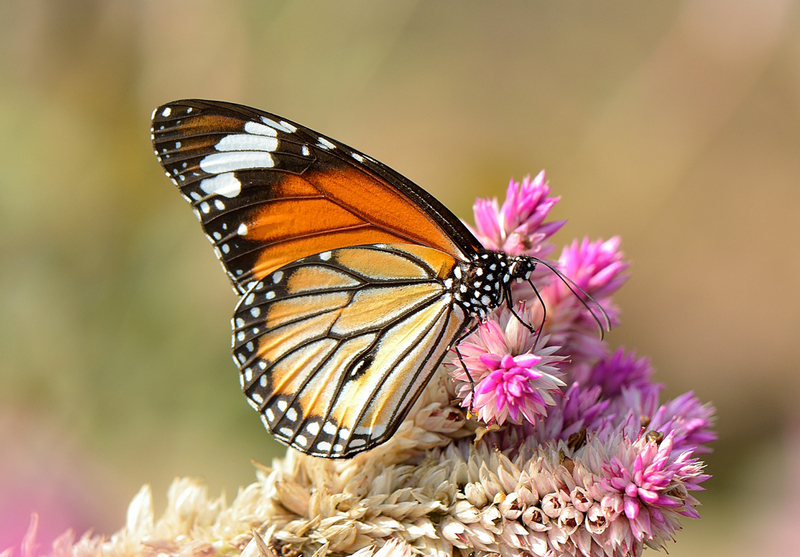 It bears a resemblance to the world renowned butterfly migrant, the Monarch (Danaus plexippus) of North America to which it is closely related. 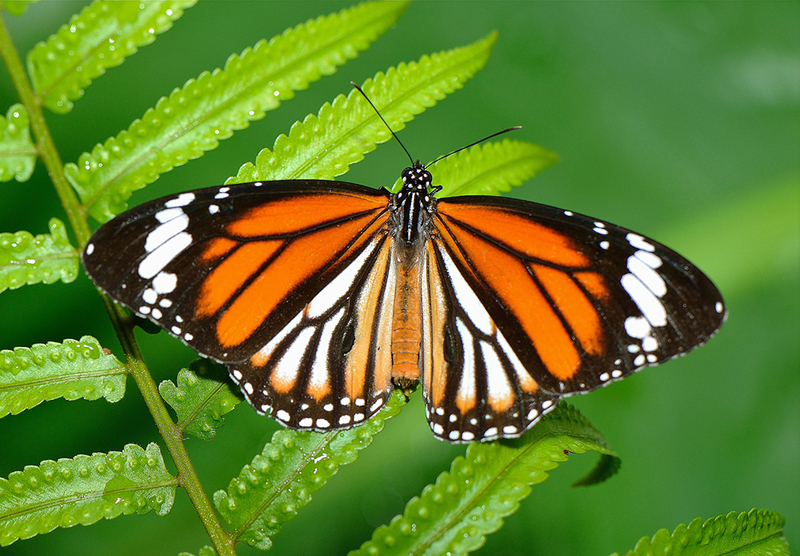 The Common Tiger is one of three orange Butterfly ‘Tigers’ found in Singapore. 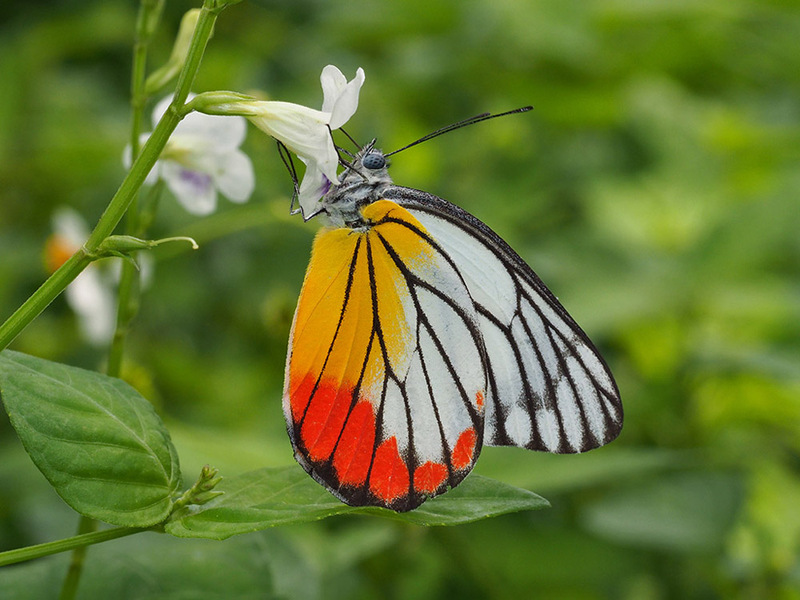 The butterfly has 2 forms: form genuita with orange hindwing and form intermedius with white borders tinged with orange. Both forms can be found together but the form genutia is more common. It is an adaptable butterfly. It is found mainly in coastal and mangrove habitats where its host plant ‘Cynanchum’ resides. However, it can also be seen in urban environments like gardens and parks. It is big, conspicuous and unmistakable in the forest. Malay villagers in Malaysia call it ‘surat’ or letter as it literally looks like a piece of paper floating in the wind with words inscribed on it. Its beauty is recognised by many. Its forewings are very long and nicely shaped. In the air, it glides slowly and majestically. Many are inspired by its simplistic beauty and elegance. 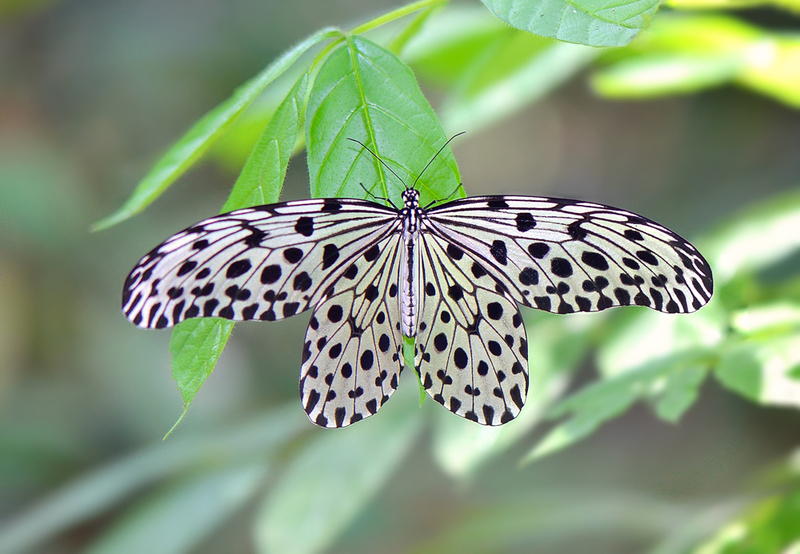 The Common Tree Nymph is an adaptable butterfly. It can be found not just within the forests, but also in parks and gardens at the forest edge. To vote for your National Butterfly, fill in your particulars and click on the circular radio button below the butterfly of your choice. The results of the vote will be announced in the later part of 2015. The name of the butterfly with the highest number of votes will be announced. All those who selected the winning butterfly will be eligible for a lucky draw and stand to win an exciting Mystery Prize. Lucky draw winners will be contacted via email.